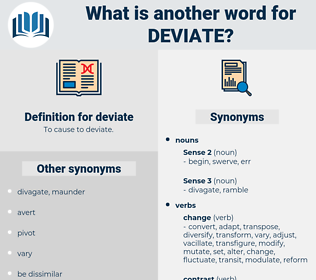 What is another word for deviate? 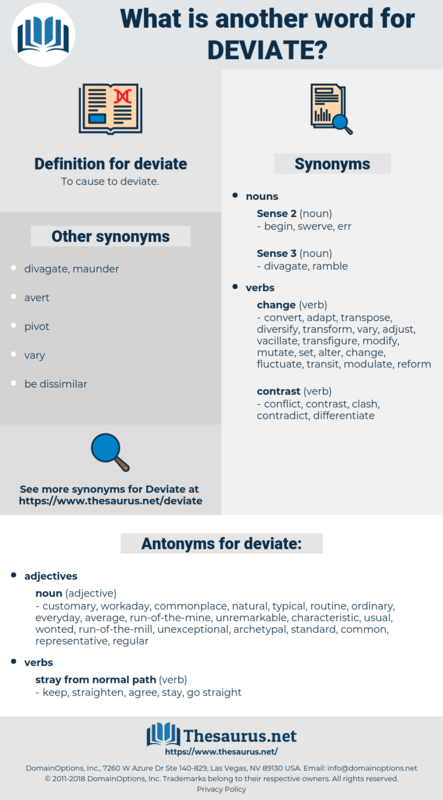 depart, diverge, differ, divert, deflect, stray, distract, vary, veer, derail, detract, bypass, circumvent, leave. customary, workaday, commonplace, natural, typical, routine, ordinary, everyday, average, run-of-the-mine, unremarkable, characteristic, usual, wonted, run-of-the-mill, unexceptional, archetypal, standard, common, representative, regular. keep, straighten, agree, stay, go straight. It is a law of nations from which they never deviate. It is most essential that in times of such national excitement and emergency as those through which so many countries in the world are now passing that the believers should not allow themselves to be carried away by the passions agitating the masses, and act in a manner that would make them deviate from the path of wisdom and moderation, and lead them to violate, however reluctantly and indirectly, the spirit as well as the letter of the Teachings. debt, doubt, devout, dead body, daybed, deadbeat, defat, depot, duvet, debate, deputy, deft, devoid, day by day, daft, dubiety, dipodidae, defeated, DVD, devote, doped, diabeta, defeat, deep-dye, david, depth, debut, deadbeat dad, day bed, davit, divide, devoted, debit, deathbed, deep-eyed, deaf-aid, dipped, devotee, divot, depute, divided. depart, yaw, straggle, shunt, sidetrack, perturb, digress, detour.